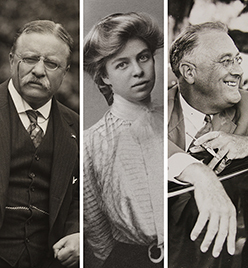 You’ve created another maddeningly addicting documentary, this one on The Roosevelts. I’m going to be tied to this computer for every spare moment until the final minutes of the whole fourteen hours. I have rooms to paint and lawns to mow. How did you get George Will to talk in favor of government regulation? Did you torture him first? Was it a trick of clever editing? Highly recommended. Check your local PBS station for scheduling or watch it online at pbs.org.